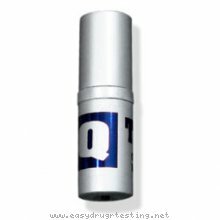 Detox products: QTEST Saliva Biotested - Ovulation Prediction Test. Pass drug tests, passing all drug test. New Ovulation Prediction Biotester on Market - QTEST™. 1 Year full warranty *. It is a small microscope that could show to you structure of woman body physical liquids, like saliva or vaginal liquid. You can see three different results: Fertile Period, Non-Fertile Period, and Transitional Period.